It is the policy of the Manitoba Robot Games to respect and protect the privacy of all of our competitors and volunteers. In this policy the term “Competitor” includes builders, drivers and coaches. In this policy the term “Information” includes names, addresses, phone numbers and e-mail addresses. The Manitoba Robot Games database collects Information which is used to identify competitors and volunteers as part of the registration process. It is also an essential tool to use in case of emergencies during the Games. The Information will be stored only in the Games database available to Manitoba Robot Games Committee members and specially designated volunteers. The Manitoba Robot Games will make every effort to ensure that the Information will be maintained in a secure environment. Manitoba Robot Games staff or volunteers will not sell, trade, or disclose to third parties, any identifiable Information without the consent of the competitors or volunteers (except as required by subpoena, search warrant, or other legal process or in the case of an imminent physical harm to a competitor, volunteer or others). The Manitoba Robot Games retains personal information only as long as is necessary in relation to the Games and deletes or destroys this information after a reasonable amount of time. In some cases, legal reporting and retention requirements necessitate that the Manitoba Robot Games retain information for a specific amount of time. In general, the Manitoba Robot Games will not retain information for a period longer than three years. 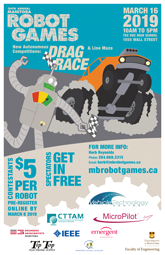 The Manitoba Robot Games does not sell or provide any personal information to third parties.